General Description: Hydrilla is a submersed perennial herb, growing rooted to the bottom, in either still or flowing water. Hydrilla may be moneocious plants (male and female flowers on the same plant) or dioecious (male and female flowers on different plants). Flower Description: Female flowers have 3 translucent petals and 3 whitish sepals and float on the water’s surface. Male flowers have 3 white to red narrow petals and 3 white, red or brown sepals and form in leaf axils to break free when mature to float on water’s surface. Leaf Description: Leaves are in whorls of 3 to 10 along the stem, each 2 to 20 mm long by 1 to 4 mm wide. Leaf margins generally have sharp spines, giving them a toothed appearance. Spines occur on lower midvein, causing plant to feel rough. Fruit/Seed Description: Hydrilla can produce seeds but it mainly spreads by tubers, turions and stem fragments. 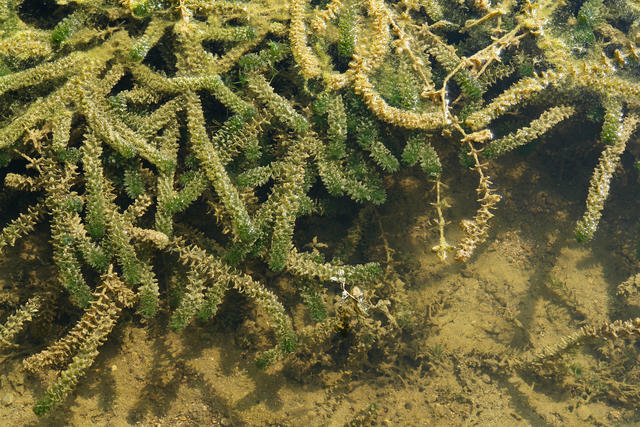 Hydrilla forms dense canopies that often shade out native vegetation. Extensive single species stands provide poor habitat for fish and other wildlife. Once established, it destroys freshwater recreational opportunities by forming extensive surface mats.